Descents can be accomplished with a constant rate, constant airspeed, or a combination. The following method can accomplish any of these with or without an attitude indicator. Reduce the power to allow the aircraft to decelerate to the desired airspeed while maintaining straight-and-level flight. As the aircraft approaches the desired airspeed, reduce the power to a predetermined value. The airspeed continues to decrease below the desired airspeed unless a simultaneous reduction in pitch is performed. The primary instrument for pitch is the ASI tape. If any deviation from the desired speed is noted, make small pitch corrections by referencing the attitude indicator and validate the changes made with the airspeed tape. Utilize the airspeed trend indicator to judge if the airspeed is increasing and at what rate. Remember to trim off any control pressures. The entry procedure for a constant rate descent is the same except the primary instrument for pitch is the VSI tape. The primary instrument for power is the ASI. When performing a constant rate descent while maintaining a specific airspeed, coordinated use of pitch and power is required. Any change in pitch directly affects the airspeed. Conversely, any change in airspeed has a direct impact on vertical speed as long as the pitch is being held constant. When leveling off from a descent with the intention of returning to cruise airspeed, first start by increasing the power to cruise prior to increasing the pitch back toward the level flight attitude. A technique used to determine how soon to start the level off is to lead the level off by an altitude corresponding to 10 percent of the rate of descent. For example, if the aircraft is descending at 1,000 fpm, start the level off 100 feet above the level off altitude. If the pitch attitude change is started late, there is a tendency to overshoot the desired altitude unless the pitch change is made with a rapid movement. Avoid making any rapid changes that could lead to control issues or spatial disorientation. Once in level pitch attitude, allow the aircraft to accelerate to the desired speed. Monitor the performance on the airspeed and altitude tapes. Make adjustments to the power in order to correct any deviations in the airspeed. Verify that the aircraft is maintaining level flight by cross-checking the altimeter tape. If deviations are noticed, make an appropriate smooth pitch change in order to arrive back at desired altitude. Any change in pitch requires a smooth coordinated change to the power setting. Monitor the airspeed in order to maintain the desired cruise airspeed. To level off at a constant airspeed, the pilot must again determine when to start to increase the pitch attitude toward the level attitude. If pitch is the only item that is changing, airspeed varies due to the increase in drag as the aircraft’s pitch increases. A smooth coordinated increase in power needs to be made to a predetermined value in order to maintain speed. Trim the aircraft to relieve any control pressure that may have to be applied. Overcontrolling pitch on beginning the climb. Aircraft familiarization is the key to achieving precise attitude instrument flying. Until the pilot becomes familiar with the pitch attitudes associated with specific airspeeds, the pilot must make corrections to the initial pitch settings. Changes do not produce instantaneous and stabilized results; patience must be maintained while the new speeds and vertical speed rates stabilize. Avoid the temptations to make a change and then rush into making another change until the first one is validated. Small changes produce more expeditious results and allow for a more stabilized flightpath. Large changes to pitch and power are more difficult to control and can further complicate the recovery process. Failure to increase the rate of instrument cross-check. 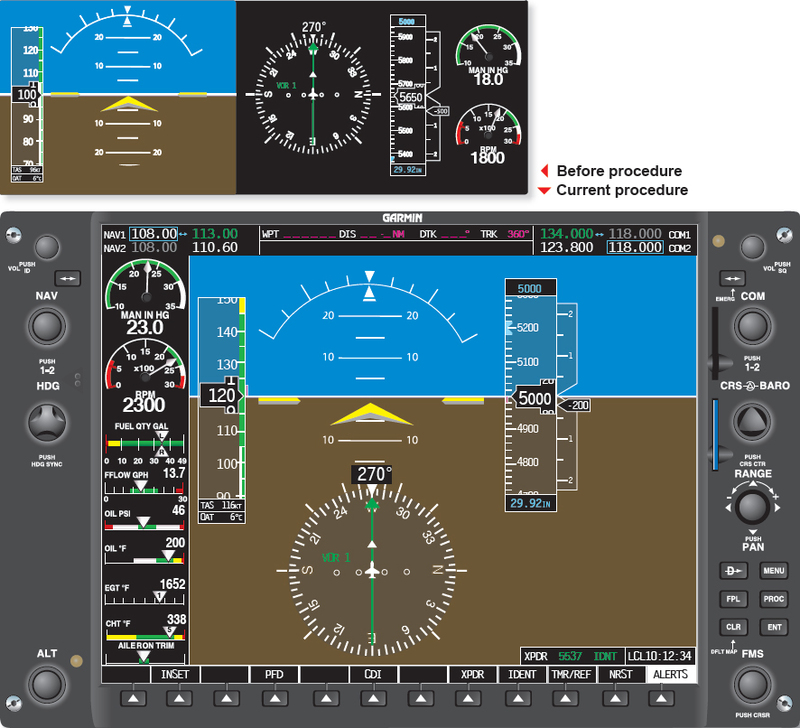 Any time a pitch or power change is made, an increase in the rate a pilot cross-checks the instrument is required. A slow cross-check can lead to deviations in other flight attitudes. Failure to maintain new pitch attitudes. Once a pitch change is made to correct for a deviation, that pitch attitude must be maintained until the change is validated. Utilize trim to assist in maintaining the new pitch attitude. If the pitch is allowed to change, it is impossible to validate whether the initial pitch change was sufficient to correct the deviation. The continuous changing of the pitch attitude delays the recovery process. Failure to utilize effective trim techniques. If control pressures have to be held by the pilot, validation of the initial correction is impossible if the pitch is allowed to vary. Pilots have the tendency to either apply or relax additional control pressures when manually holding pitch attitudes. Trim allows the pilot to fly without holding pressure on the control yoke. Failure to learn and utilize proper power settings. Any time a pilot is not familiar with an aircraft’s specific pitch and power settings, or does not utilize them, a change in flightpaths takes longer. Learn pitch and power settings in order to expedite changing the flightpath. Failure to cross-check both airspeed and vertical speed prior to making adjustments to pitch and or power. It is possible that a change in one may correct a deviation in the other. Uncoordinated use of pitch and power during level offs. During level offs, both pitch and power settings need to be made in unison in order to achieve the desired results. If pitch is increased before adding power, additional drag is generated thereby reducing airspeed below the desired value. Failure to utilize supporting pitch instruments leads to chasing the VSI. Always utilize the attitude indicator as the control instrument on which to change the pitch. Failure to determine a proper lead time for level off from a climb or descent. Waiting too long can lead to overshooting the altitude. Ballooning—Failure to maintain forward control pressure during level off as power is increased. Additional lift is generated causing the nose of the aircraft to pitch up.